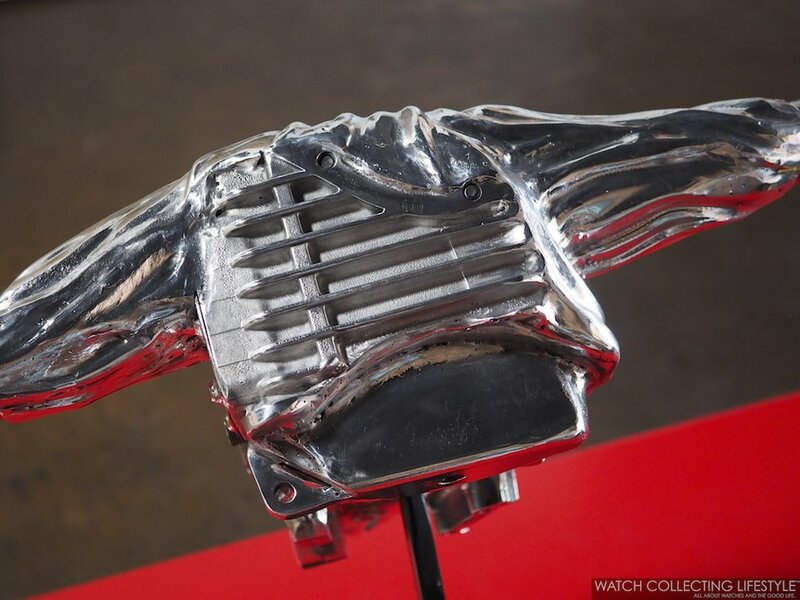 When engine block parts, exhaust manifold remains, car exterior body parts and other car parts straight from legendary Ferraris are properly manipulated by artist James Ferrari —not associated with Ferrari S.p.A or Enzo Ferrari's lineage— absolute magic happens. As soon as you walk into the Ferrari Gallery you know you're in for a real treat when you first see that elk with huge antlers formed out of Ferrari parts. Titled 'Elk 550 F022', this massive sculpture that looks like a hunting trophy —but where no beating heart was stopped by a bullet— is an impressive work of art that blends different parts of a Ferrari 308, an F355 and a 550 Maranello. Carefully sculpted and shaped as an elk, an exhaust manifold from a long gone F355 marries the bell housing of a legendary 308 with the intact and gorgeous exterior body remains of a navy blue Ferrari 550 Maranello. A quarter panel and a rear bumper transform into the neck and front shoulders of an eight foot tall elk. 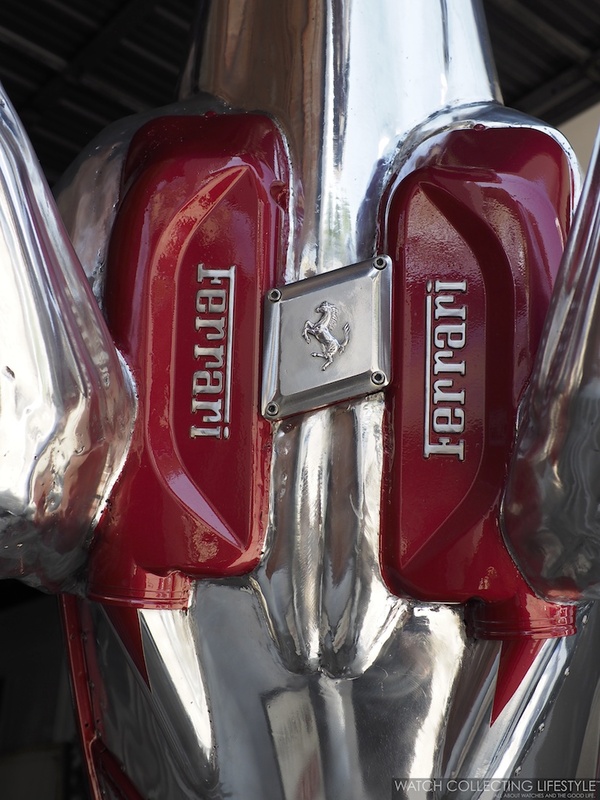 Priced at almost sixty thousand dollars, this incredible sculpture features the most realistic antlers we've ever seen made out of stainless steel over a massive head with a snout adorned by Ferrari's 'Cavallino Rampante'. These creations come to life just as if alchemy had been part of the process through the vision and the talented hands of James Ferrari. James is an American metal sculptor that was born in New York and grew up between New York City and Southwest Florida. For twenty years he has created many works of art for private, public and corporate collectors. His passion to become a sculptor was ignited during his last semester at FSU —Florida State University. In 1993, FSU purchased his fourth sculpture titled 'Victory' for public art display at The Bobby E. Leach Center. Named one of the up-and-coming contemporary artists by New Art International, James' work has been exhibited at the New York Sculpture Society, The Alliance of The Arts Museum, The Concours d' Elegance at Pebble Beach, The Naples Botanical Gardens, Southwestern Art Fairs and Art Wynwood in Miami. After living in Colorado for a number of years, Dallas is now James' home along with his wife Debra who also happens to be another impressive and talented artist. 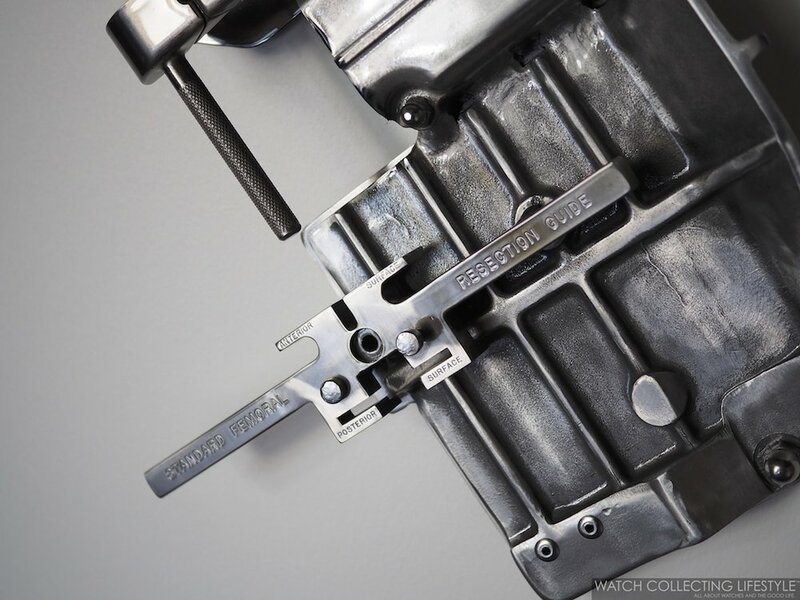 While his collection of sculptures made out of of salvage Ferrari parts includes many many pieces, there are a few that stand out and one in particular that we absolutely love. 'The World's Fastest Tuna F031' —unfortunately just sold for $28K USD— is our absolute favorite and an impressive three foot long metal fish. 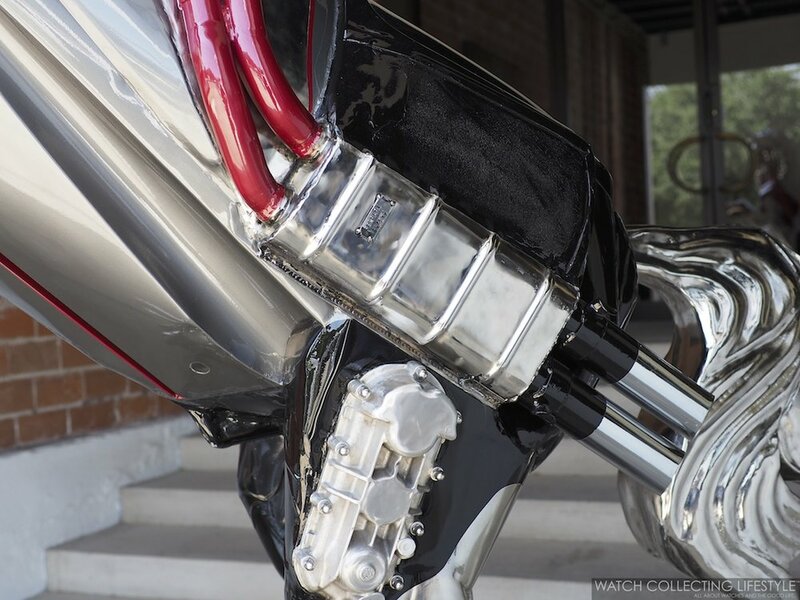 Made of a Ferrari 308 air intake, an F355 exhaust manifold, a section from the gearbox of a 328 and stainless steel parts that James has welded together, the fish was further transformed by a careful sculpting, chroming and polishing process. And just like that Hublot Big Bang Ferrari with its shiny 'Cavallino Rampante' on the dial, James' work includes several prancing horses honoring the iconic horse on the Ferrari logo that was inspired by the prancing horse on an aircraft piloted by Italian ace fighter Count Francesco Baracca who had a fatal crash in 1918 during World War I. Titled 'Testarossa Prancing Horse F013' this is the second biggest horse sculpture in James Ferrari's collection and a piece that stands at 65" —1.65 meters—tall with its striking original Ferrari red painted torso and legs. 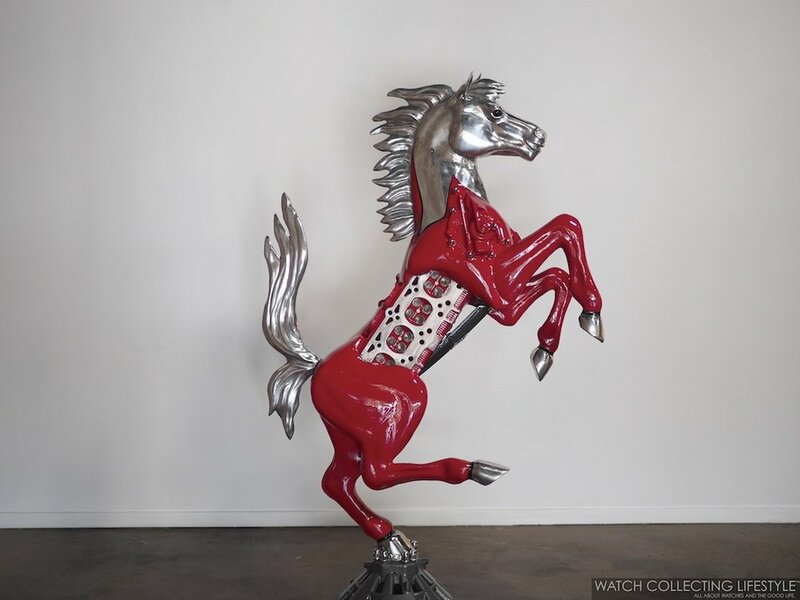 The horse is made of a Ferrari Testarossa Cylinder Head, an F355 clutch housing, a 575 front grill that sits on the horse's belly and visible from underneath the horse, a 456 Ferrari Italia clutch housing and miscellaneous Ferrari car parts, aluminum and stainless steel. Priced at $42K USD, this sculpture shows James' ability to work with the parts and create other shapes and forms with his skillful hands. The horse stands on a gunmetal grey conical base that allows for the horse to be spun freely 360 degrees. 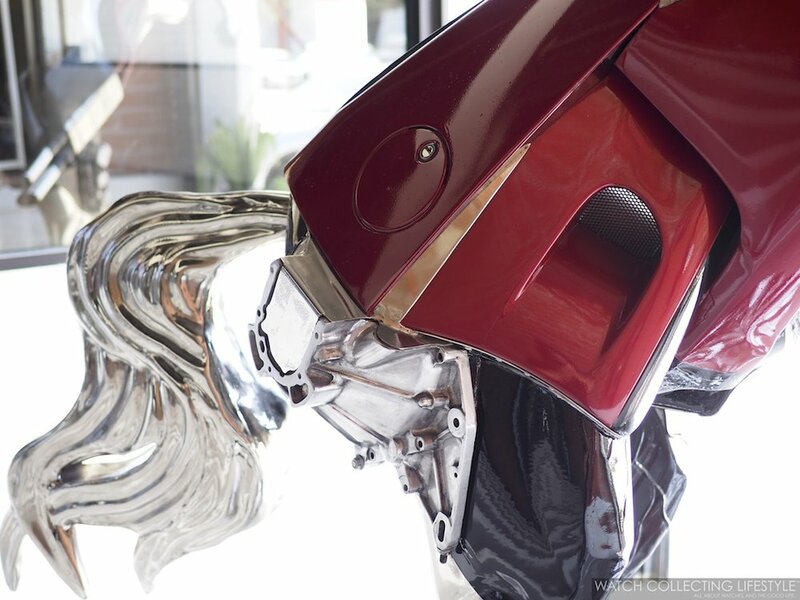 Ferrari's innate talent and ability at creating these incredible sculptures is further showcased by the longhorn inspired pieces hanging from the walls at his gallery in Dallas. 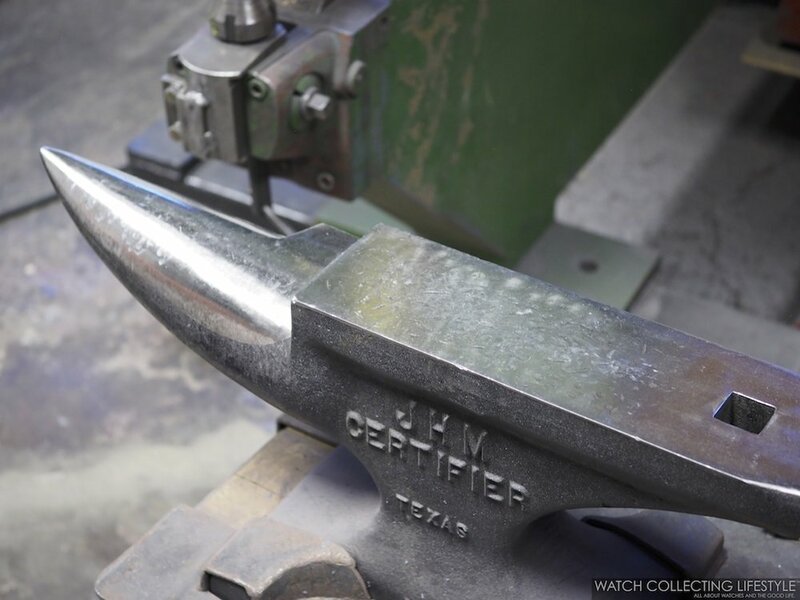 These particular sculptures pay homage to Texas folk culture by recreating the characteristic horns —that sometimes extend to almost seven feet/2.10 meters— of the Texan breed of cattle that is a direct descendant of the first cattle brought by Christopher Columbus to the new world. The first set of longhorns is titled 'Sequoia F029' and while it's set on a table stand, it offers the ability to also hang the steers from the wall. 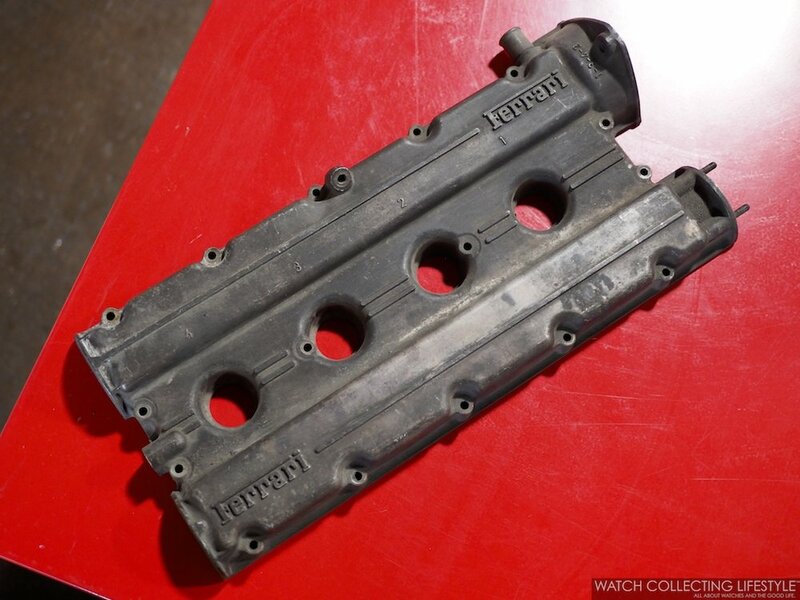 This particular piece is made out of a Ferrari 328 Gearbox section, a 308 valve cover section, a 308 cylinder head, aluminum and stainless steel. Priced under $10K, this is one of the least expensive pieces in his collection and worth every single penny. The second set of steers is priced right under $20K and it's titled the 'Daytona F355 Longhorn F007'. 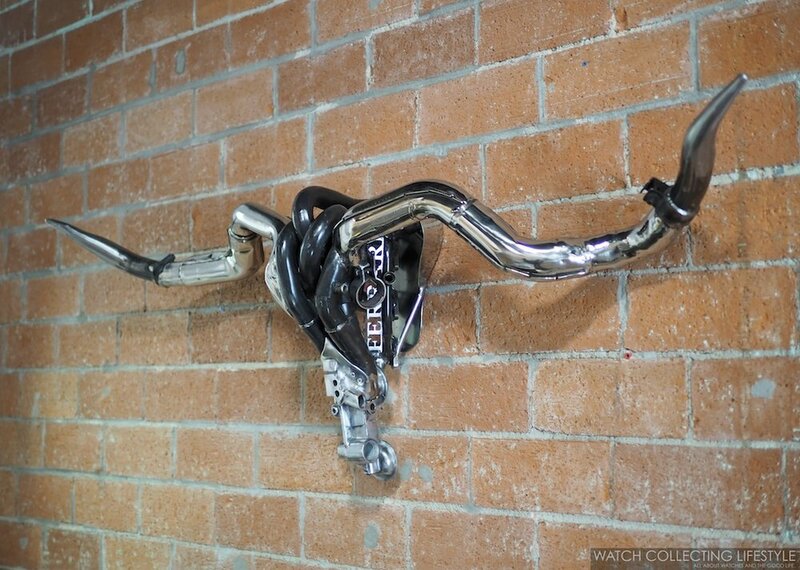 This set of horns are made from two exhaust manifolds, one from a Ferrari 365 GTB Daytona and the other from an F355. 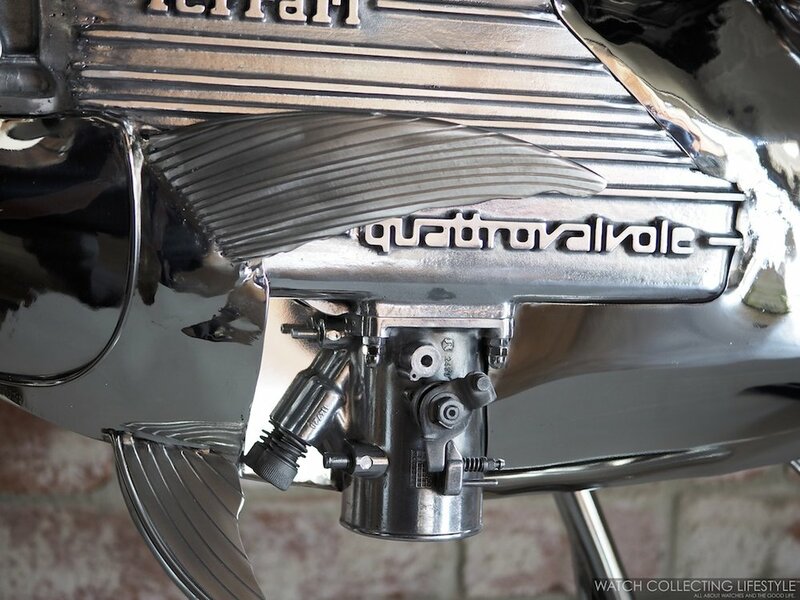 Then comes the 'Quattrovalvole Prancing Horse F014' made from a complete Quattrovalvole Ferrari 308 air delivery body, a 308 valve cover, a 308 intermediate plate, a 360 wheel hub, other miscellaneous Ferrari parts and aluminum components. Measuring 55" tall —approximately 1.40 meters—, this sculpture is set over a base that allows for 360 degree rotation of the 'Cavallino Rampante' —prancing horse. Priced at $35K, this piece is finished with a beautiful original Ferrari red automotive paint. 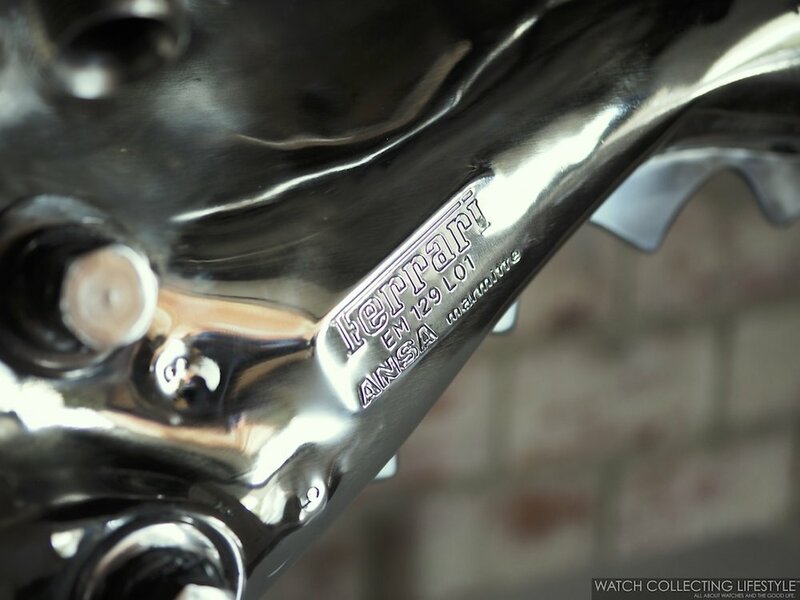 Other sculptures at a more affordable price point —$4,800 to $9,500 USD— include a hanging sculpture titled 'Healer' which is made from a Ferrari 308 valve cover, gearbox sections from a 308, a standard femoral resection guide and miscellaneous orthopedic surgical guides; 'Genesis' is a smaller sculpture placed on a base that allows for full rotation of the piece and it is made out of a Ferrari 308 Bell housing that has been finished with original Ferrari paint mixed with lacquer in a pinkish color; and a pedestal small sculpture named '308 Cylinder Head Abstract #1 F024' after the salvage Ferrari car part utilized for its creation. Lastly, the biggest sculpture in the collection and the most expensive of them all is the one that sits outside the Ferrari Gallery in the Dallas Design District and the one that drove us into this sanctuary of fine art that meets automotive 'savoir-faire'. This outdoor sculpture that majestically stands at 10 feet —3 meters— tall is not only the piece that includes the largest number of salvage Ferrari parts —including a door skin and a bumper section— but also one of the first ones ever created by James Ferrari. Priced in the six-figure range at $125K USD and named 'The Ambassador', this massive horse is the best way of admiring the remains of a coveted Ferrari with all sorts of salvage Ferrari parts. Including parts of seven different Ferraris, the Ambassador takes its form and shape from a Ferrari 512 TR engine lid section, a 308 door skin, a 308 timing belt cover, a 360 bumper section, a 308 bell housing, an F355 roof section, an F360 air delivery body, a 328 gearbox cover, a 400 i exhaust and welded and finished with stainless steel and aluminum parts. A talented artist that has mastered the art of luxury sculpting with nothing else but parts from the most iconic sports car of all time. For more info on the Ferrari Gallery click here.